I have a B2150 with modified turf tires (R4's), I believe you call them. I would like to put chains on the back. Do they make chains for tractor tires that are not agg tires? There are probably some other variants of these but the codes above are the standards. For most uses 4WD tractors work fine without chains. Just a word of advice here though. Tire chains are only for the REAR tires, not all four. Yes thank you, I understand that you should not put chains on the front, as the gears are not robust eneough. It's not a matter of robust, the front axle is usually turning at about 5% faster than the rear does. If you use chains, or even drive in 4WD on a hard surface where the tire can't slip, you will cause a lot of unnecessary wear & tear on the drive train and tires. A large city near here had a fleet of small 4WD CUTS for clearing the snow on sidewalks, etc., but also used them for grass work in the summer. The people in the purchasing dept. decided the proper sized turf tires to match the rears (212/80-15's) were too expensive, so they used 205/80-15 car tires instead, saved them $50 a tire. Within a year every tractor had only 2WD, the center gears were all shot from screwing up the lead in the front gear ratio. Any tractor dealer that does tires or tire dealer that does tractors can fix you up. I use chains on all four for snow pushing and haven't had any trouble yet, but it's only been 30 years. But I never use 4WD unless there's slippage. Have you tried installing chains on all 4 tires and had problems? 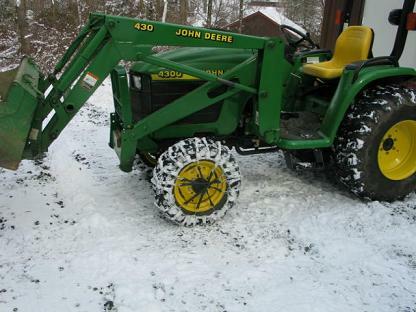 I have ag tires on a L4310 and it usually works good, except on ice - and it's sleeting now in central NH. Dave, we have a few machines that live up in the lake country for the winter clearing private lanes, some of them are a few miles long. All of those machines are chained (with v-bar style ice chains) on all 4 wheels, but only because of the extreme conditions and the lack of a hard surface to create gear binding problems. Many times I do not run fronts. But with bucket on I can install them in 5 minutes. Rear chains stay on all winter if I have to put them on. They, rears, weight over 100#s each. There is a lot of iron in them...Homemade... x links every other side link heavy duty truck and grader chain. They, fronts, are only on in the extreme conditions. Typically I can wind up the drive line tighter in the summer doing dirt work then I can on ice and snow even with chains. When I need chains, I only chain up the front see picture 12. 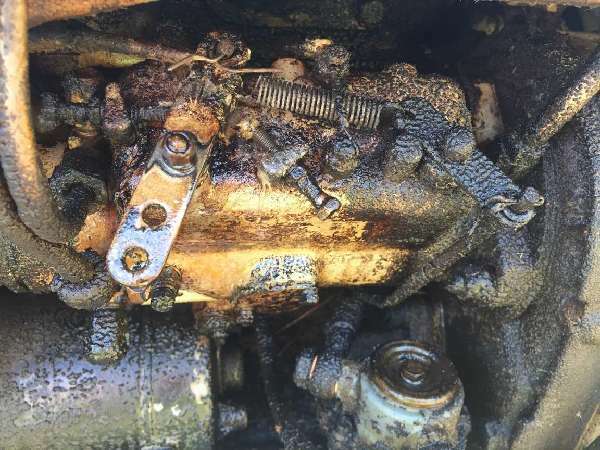 The caution is the clearance for tie rod ends and steering cylinders. The chains are light, cheap and very easy to install with the loader on. I get extremely good traction and have never needed more. In 2 wheel drive the tractor barely moves if I am lucky so the rear isn't doing much anyway. It rarely is on my tractor. When really using the loader, the rear is so light it slides down hills, won't dig, etc in 2 WD. Both rears are filled with calcium. The front does most of the work and carries most of the weight, more than the back ever has as I have never wheelied but have rode on just the front. It just shows how backward most of America's tractors are. We put the light duty axle with the pizza cutter tires up front where the weight and traction is.